Passable sequel didn't really need to be made. The gimmick isn't a bad one, and the film is correctly pitched to its target audience (i.e children) who should get a kick out of watching an oversized kid stomping around Las Vegas like a benevolent Godzilla. 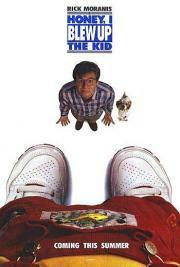 Moranis is his usual amiable self, and the film is good natured to a fault, which makes it hard to outright hate. It just lacks qualities that adults can appreciate that were vaguely present in Shrunk, like ingenuity and wit. It's hard for me to say too much bad about this. Yes, it is woeful to watch but it isn't insulting, so I can't say that I hated it. The kids loved it and it's harmless, but a total snooze for the grown-ups. 1992 chroma-key quality in full effect (i.e. it's painfully obvious). Fun but not as good as the first. Dumb and overly-cutesy, but harmless. There are a couple laughs and some good effects, but not much more. Not as terrible as the scores here would have you believe. Yes, it's the first one all over again only in the other direction; but it still has lots of fun with the premise and I was ultimately entertained. Nov 26, 2016 ??? ??????? ?